And since it's January, I'm hyped out of my mind for Nationals and I actually have a little bit of free time for once. Let's not talk about how long this took to pull together! Very few people spend extended periods of time training optimally for cyclocross -- for most of us, this is a hobby. 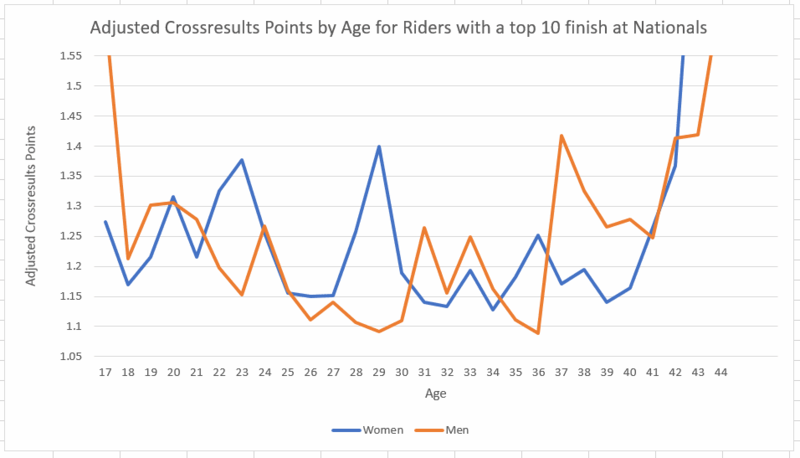 How fast we ride year-to-year is affected by a lot of variables in life (kids, jobs, spouses, other hobbies, presidential elections), so looking at the pure correlation between rider ages and crossresults points isn't terribly useful. We're gonna try to look at "pros," with the assumption that pro cyclists are more or less racing as well as possible every year. If they get slower, or faster, between years, it's more likely to be due to age than for the average joe. 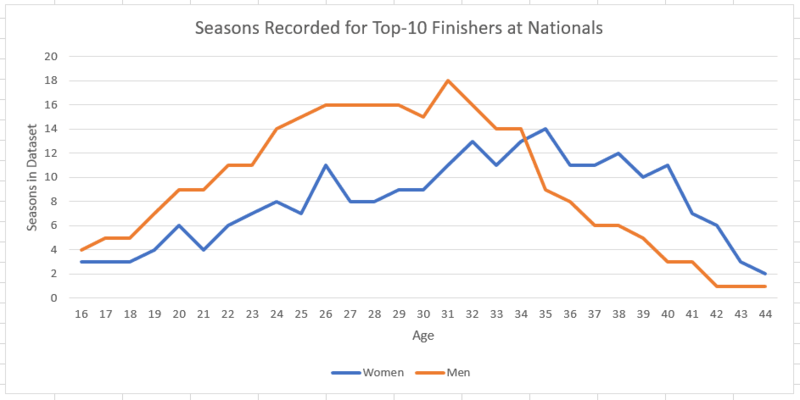 To be included in the data I looked at, you had to finish in the top 10 of an elite nationals at least once from 2006-2016. This means we're looking at the careers of 36 men and 37 women. THIS IS NOT A LARGE SAMPLE SET. I know. We're trying to figure out how good someone's season at a certain age. Because crossresults points change somewhat from year to year (winning Nats in 2007 was worth 115 points, winning Nats in 2016 was worth 143. Because reasons), I looked at crossresults points scored relative to the predicted winner at Nationals that year. 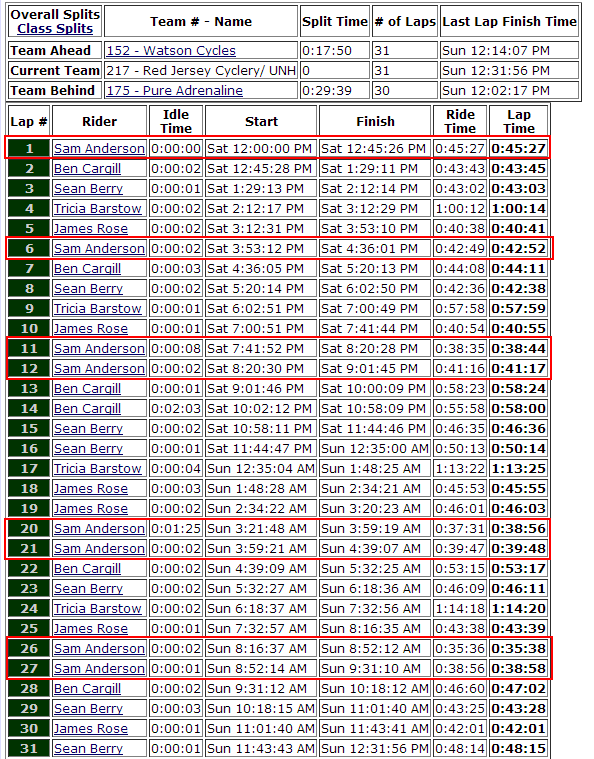 For example, at 2009 Nationals, Tim Johnson was predicted to win with 140 points, so the 2009 season baseline is 140. To evaluate someone's "year," we take the average of 10 best results from that year, and compare it to the season baseline. For example, in 2009, Justin Lindine's best 10 results average to 177.3 - so his 2009 season is rated at 1.26 (177/140). I'm calling this his "adjusted crossresults points" for the season. I should probably have a catchier acronym for this (ie Value Over Myerson Level Crosser) but I don't. 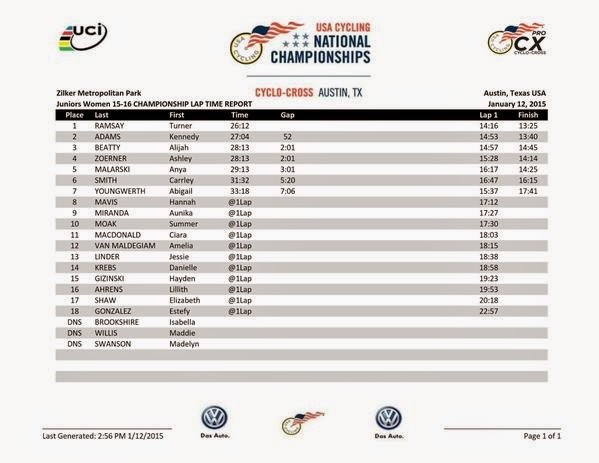 In 2012, Justin had his best year, with adjusted crossresults points of 1.07 -- the average of his best 10 results was only 7% worse than the predicted winner of that year's national champs. So that's a pretty good season! 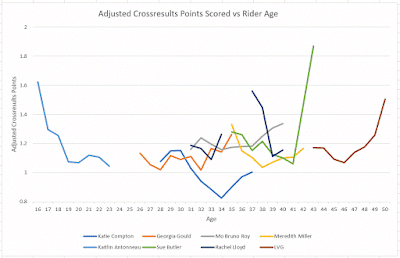 Let's look at the relationship between adjusted crossresults points and age for some well-known riders. You're gonna wanna click that to see the big version. Jeremy Powers has been at or below 1.0 for the last 8 years (age 25-32), which is ridiculously consistent (see: every other line on this graph). The only other "really good eight years" on this graph is Tim Johnson (age 29-36). Tim followed up his 8 great years with 1 bad year, and retirement at age 37. Jonathan Page is the only guy to have a truly elite season (under 1.0) after age 36. 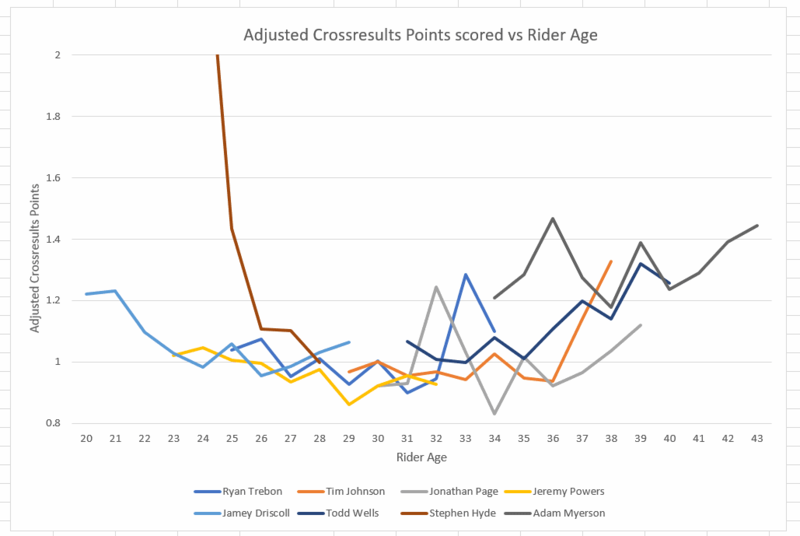 Adam Myerson isn't a truly elite rider (barely breaking 1.2 in his best year), but his season at age 40 was better than Todd Wells at 40, and looks like it will be very close to Jonathan Page at 40. Myerson is the only guy in the data to go from 35 to 40 without slowing down markedly. Stephen Hyde went from being a total unknown at 25, to being right on pace with Jeremy Powers and Ryan Trebon's careers at 28. Katie Compton is SO GOOD that no one else can even break the 1.0 mark, because she's lowered the "season baselines" that much. 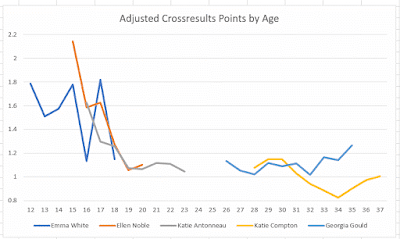 But, Katie is far less dominant at 37 than she was at 34. Laura Van Gilder is a ridiculous outlier on this graph, with a career that started at 43 and peaked at 46. Rachel Lloyd did 3 elite seasons, then took 2 years off, then took 2 more years casually -- and then did two of her bests seasons at 39 and 40. 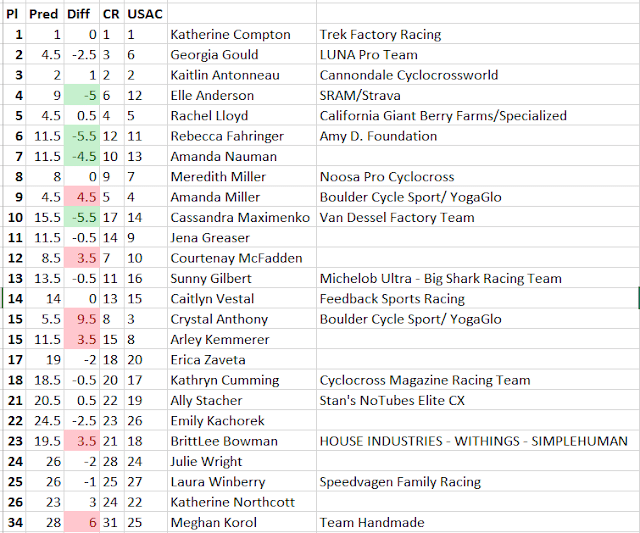 Kaitie Antonneau is the only "young" rider on this chart, because it's based on having lots of top-10 finishes at nationals (6 in 10 years). Six top-10 finishes by age 23 is, uh, really good. 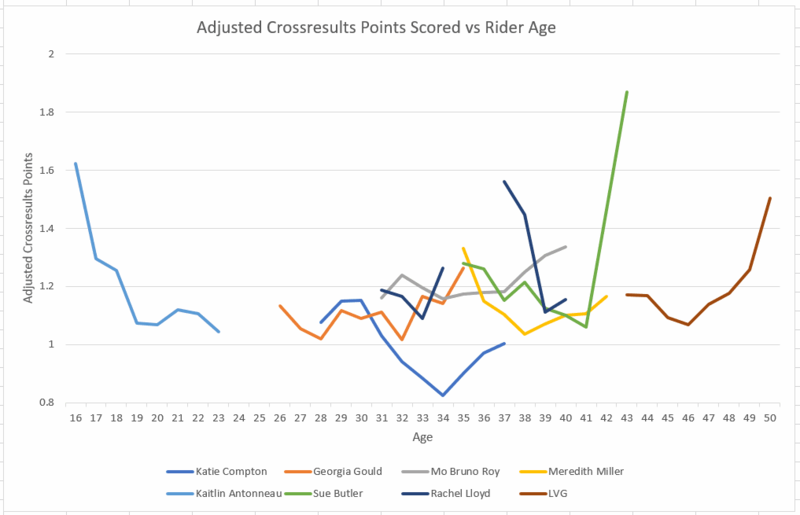 Georgia Gould is the only rider to ever be better at any age than Katie Compton. Emma White had a ridiculously good year at age 16. That's the year she took the record for "youngest UCI race winner" from Marianne Vos. 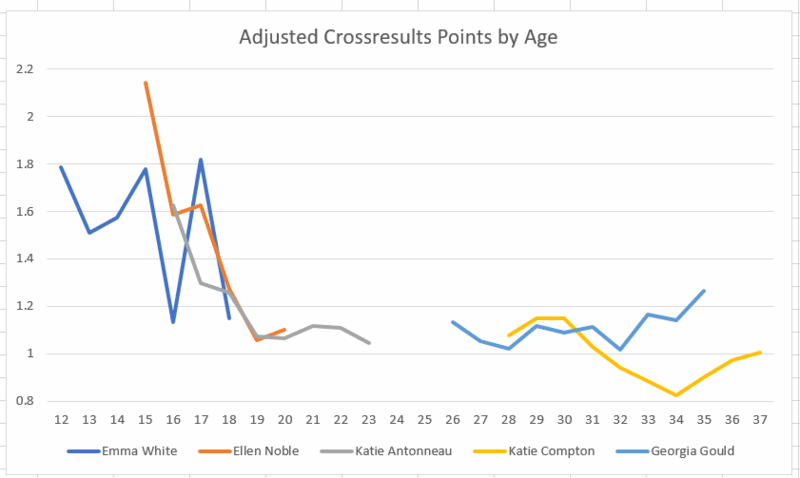 Ellen Noble's career currently looks very similar to Kaitie Antonneau's, which is to say, very good. Ellen and Kaitie have set the bar for "best young female seasons" at each age -- only to have Emma come through and break it. Haha, not at all, at least not yet. That was just a bunch of graphs of anecdotal data! You aren't really gonna try to figure out if Jon Page's bad season at age 32, followed by a career best at 34, means ANYTHING for ANYONE ELSE, right? Look at how spiky this thing is! Turns out ~36 careers per gender is a small sample size. I was hoping this would be a lot smoother. Can we draw any conclusions? Seems like women have a four-year window for remaining fast that men don't have -- men dropped off after 36, while women held out to age 40. But at age 41 they're right back together, with points 25% higher than their best season. One thing that's worth remembering here is that when someone stops racing, they disappear from the data. There are many points on this graph that are affected by very small sample sizes. There's 36 careers being averaged, yes, but a career can only be 10 years long (since that's how old crossresults is). So if we have data for you at age 22, we can't also have data for you at 38, because it hasn't happened yet. Or if we have data for you at 40, we don't have any idea how you were doing at age 25. For example, the women's data point for age 40 is based off 11 careers, which might seem like a few until I tell you that the men's data point is based off three. Seriously, of those 36 men's careers we're looking at, only 3 have an "age 40 season" we can analyze: Todd Wells, Erik Tonkin and Mark McCormack. 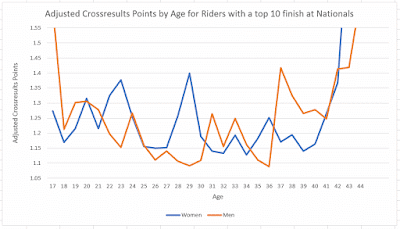 Everyone else in the dataset either quit racing by the time they were 40, or haven't turned 40 yet. 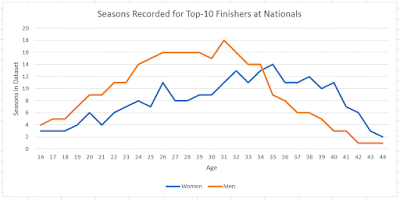 The bottom line is that top male athletes haven't recorded much data past age 35, and top female athletes haven't recorded much past 40. That might be everything you really need to know about the longevity of professional careers -- pros don't stick around to "ride slow" and give us much good data about the incremental slowdown they experience due to aging. For the most part, they just stop racing. Honestly, it means I need to wait 10 more years and do this all again. Or look up date of birth for every European pro and run the numbers over there. None of these graphs are based off a volume of data to be conclusive. What we CAN say is probably something you already knew, intuitively if not explicitly: women can compete at the elite level consistently to age 40, and outliers like Laura van Gilder can go 10 years longer. 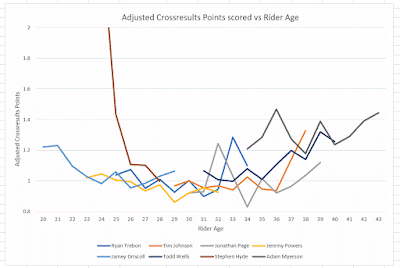 Meanwhile, a man who stays competitive in elite races to age 40 is a significant outlier (Jonathan Page). I'll turn 35 next year. Guess now I know why Masters racing starts at age 35! BUT COLIN WHAT PRESSURE ARE THEY RUNNING. DO THEY HAVE CRABON FIBRE, I HAVE SO MANY QUESTIONS.